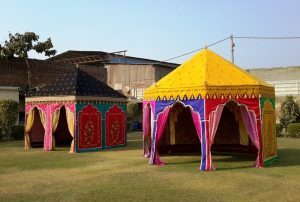 Make your’s a classy Indian wedding with our exclusive range of Indian Tents, Arabian Tents, Moroccan Tents, Party Tents and many many more styles of Tents & Cabanas. 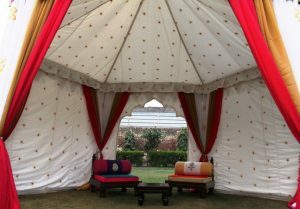 We have a Tent for every wedding function, may it be Mehndi Night or Lady Sangeet we have you covered. 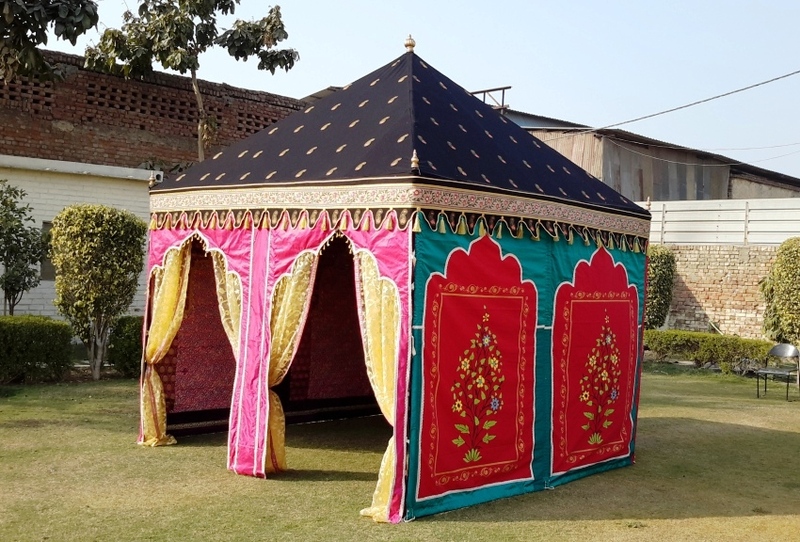 The very rich Arabian culture has lent us a lot of ideas for tents and decor for the Indian style weddings and we at Sangeeta International, have a lot to offer you for your Arabian Theme Wedding or Sangeet. 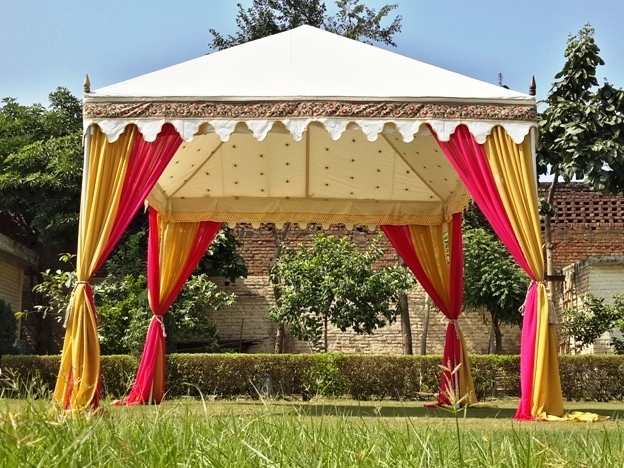 Our exclusive range of made to order Raj Tents is all about style and luxury. Your wedding should have your signature style and theme colors, only then it can become the talk of the town and a hit on social media. Your guests should leave mesmerized and completely spell bound, by your class and taste. Mehndi function is not only about music, dance & food, now a days it is a lot more about ambiance, presentation and innovative ideas. All guests enjoy taking pictures with different props in hands and beautiful and colorful backdrops. 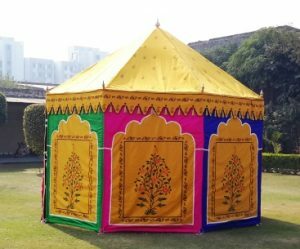 The Indian Wedding Tent always has to stand out ! 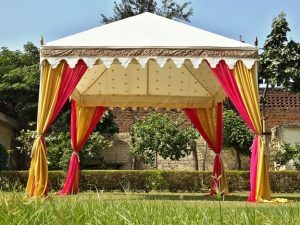 Be it a Hindu Wedding, a Sikh Wedding or a Christian Wedding, when food is served, we all like to take our seats under the Tent. 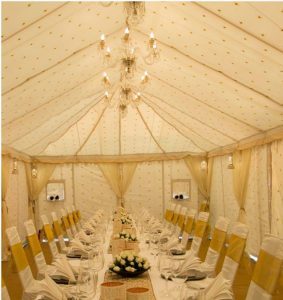 So let’s make it more special and elegant with a White Canvas Marquee. 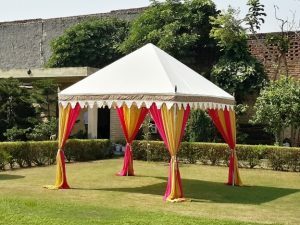 Indian Weddings are full of bright colors and pomp and show and so we make the best Fancy Tents for all the Luxurious Indian Weddings and their various Ceremony functions. 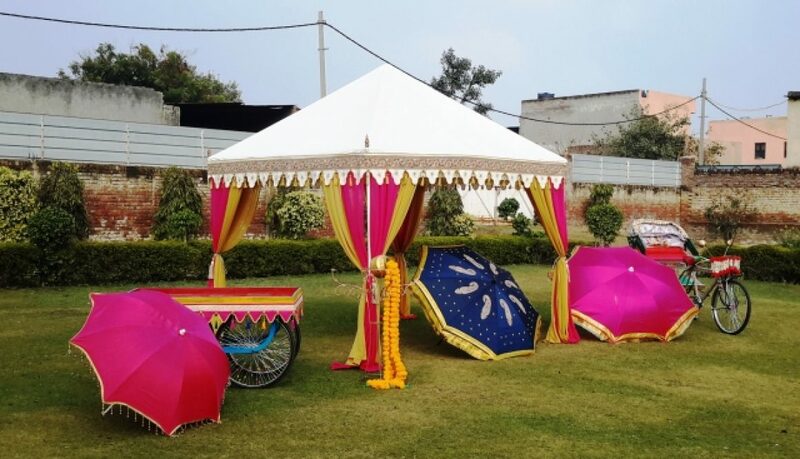 The Wedding in India is a Family affair, which means that the whole family is involved while deciding all the Big and Small details of the wedding. 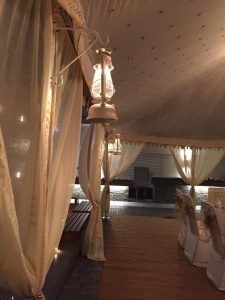 Right from choosing the Bride and Groom’s clothes to the Wedding Tent, suggestions and comments of the whole family are involved. Keeping this in mind, we offer Customized Tents, You can choose from a variety of colors, prints, fabric materials, and the decor of the Wedding Tents, Ceremony Tents, Pergola Tents and Cupola Tents. 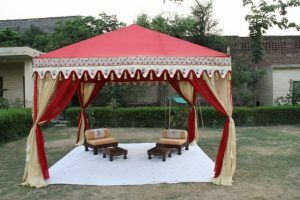 Wedding is a once in a Life time experience, so make it Huge with Luxury Indian Tents and Stunning Personalized Cabanas. 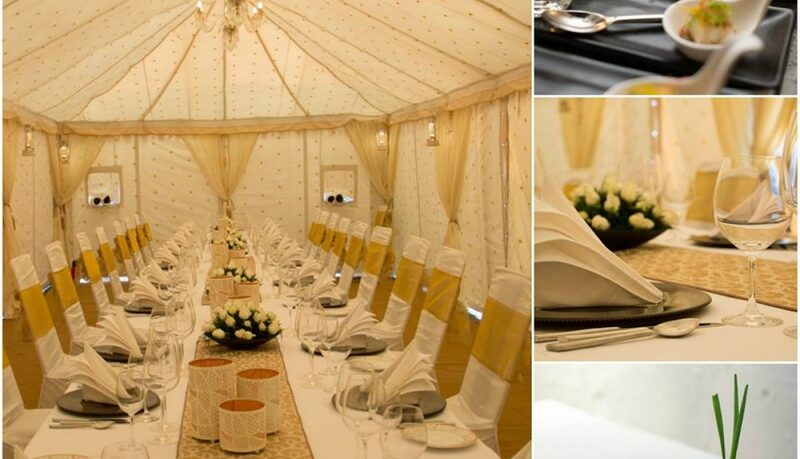 We supply Luxury Wedding Tents to make your event a memorable one. 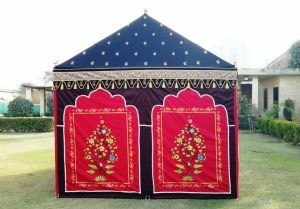 The Frame Tents are stand alone and very stable structures, with no center poles, so you can have the entire inner area for the function. 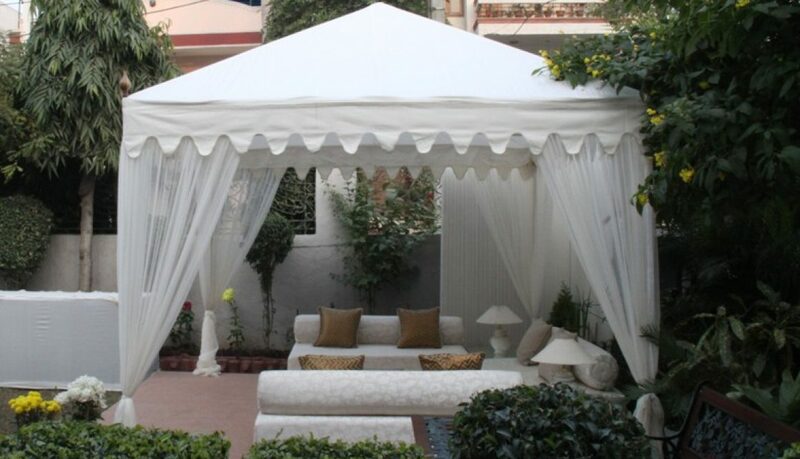 The entry to this Beautiful Pergola Tent is from all four sides, which increases its usability and functionality. 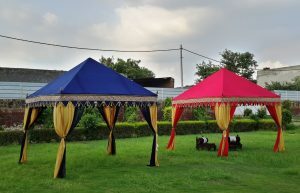 We are the Best Luxury Wedding Tents Manufacturers, Suppliers, Exporters from India, from the last more than 40 years. 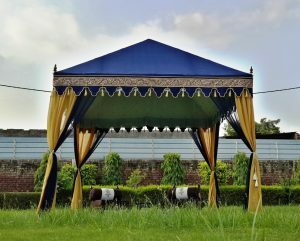 Sangeeta International is the most trusted name in the field of Tents, Pavilions and Marquees. 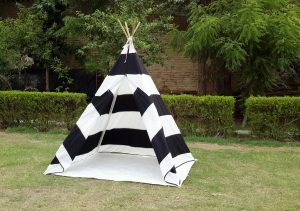 We make the Best Quality Indian Raj Tents, using Premium quality Canvas. The Canvas is treated for water-repellent & rot-resistant treatment. Our Indian Raj Tents are much in demand for Small Parties, as Personal Cabanas, Wedding Canopy & Garden Gazebo. 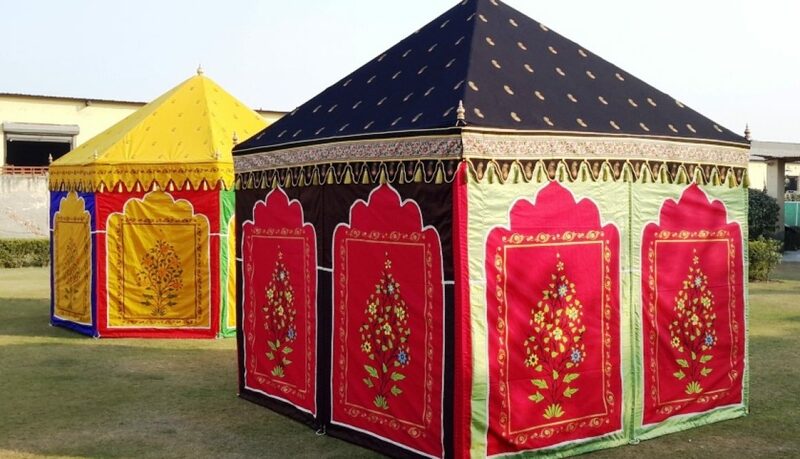 All our Raj Tents are specifically tailored and specially hand made to give a superior finish to each Tent. All our Tents incorporate modern designs yet look very traditional. 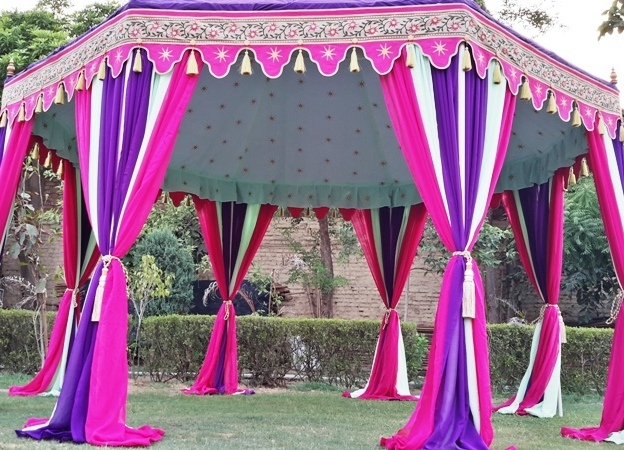 The colors add an alluring look to each Tent. 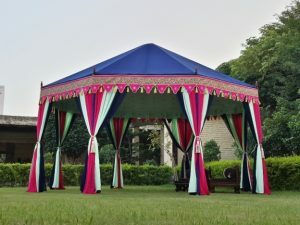 We have a very wide range of colors to offer you, you can choose a Bright Red Canvas Tent, a Navy Blue Canopy, Mustard Yellow Gazebo, Sun Yellow Cabana, Olive Green Pavilion or simply a Beautiful White Marquee. We are the leading Indian Tent manufacturers and Exporters in New Delhi, India. 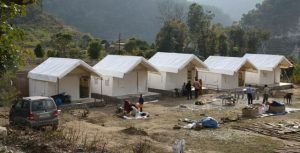 We have been exporting our Tents to USA, UK, France, Germany, Spain, Norway, Amsterdam, Australia, New Zealand, Dubai, Doha and many other countries from the last 40 years. Our experience in this field speaks for the Quality work we offer all our clients. For more About Us, Click Here. 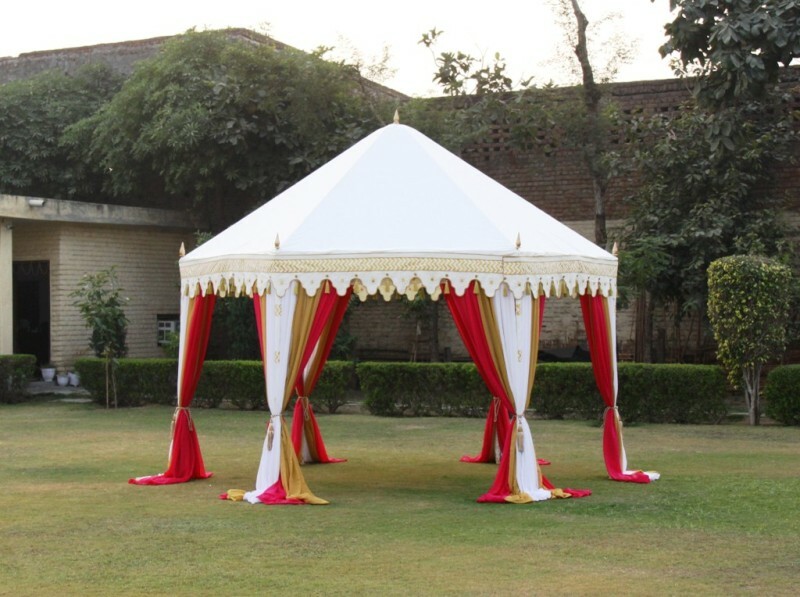 You can enjoy an exclusive party in our Very Elegant range of Indian Tents. 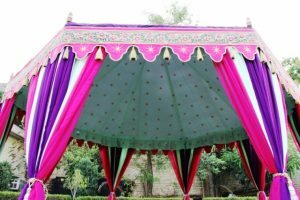 You can also order an extra, different colored Inner lining, Outer Valance and Curtains to give a completely different look to the same Tent. 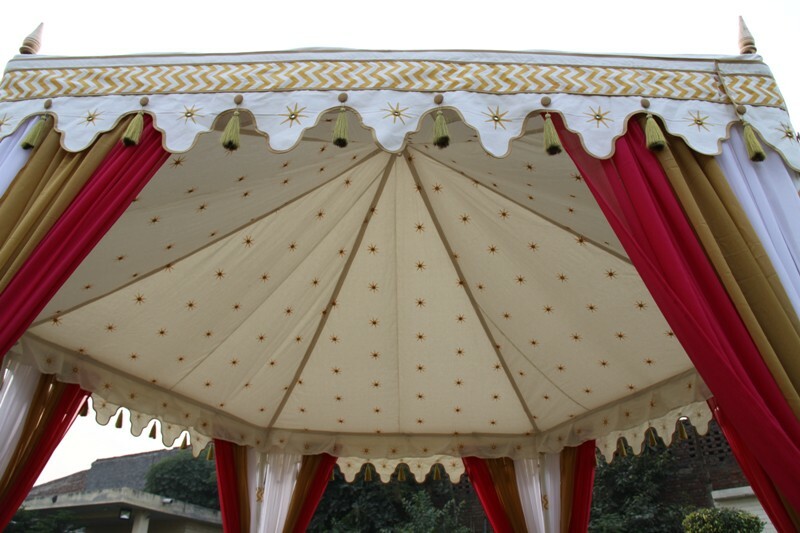 We offer many new designs of Valance and inner print patterns for each Indian Raj Tent. You could be a returning customer or a New customer, we treat all our clients equally and deliver the same quality. 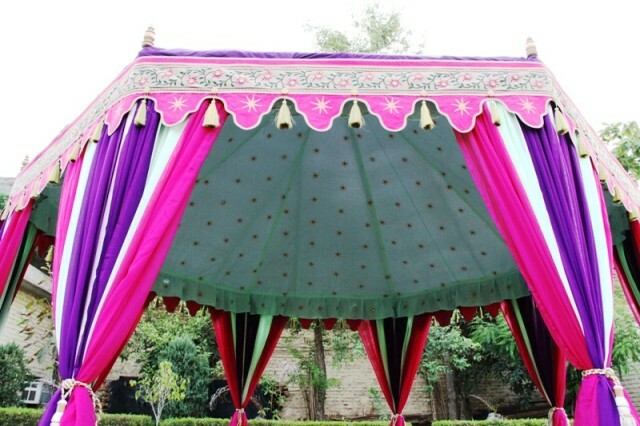 You buy a single Canopy or many large Marquees the Quality and Craftsmanship will be of Excellent Quality always. For More History Check Here. 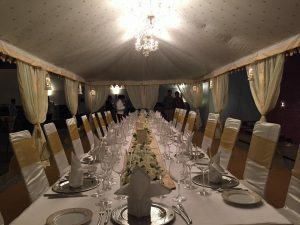 The main purpose behind holding corporate events is to bring together professionals and executives to form social bonds and public relations, and at the same time giving them a special personal experience, What can be better than holding your function in a Party Tent !!! A relevant theme for the tent helps is expressing a lot of ideas and sets the mood for higher interactions. Using Tents and Cabanas in your corporate event gives a High end quality to your party as well as a personal touch. We have Big Marquees, Event Tents and Pavilions for your Corporate Conferences, Networking events, Launching & Opening Ceremonies, VIP events, Special Corporate parties and, Milestone Parties. 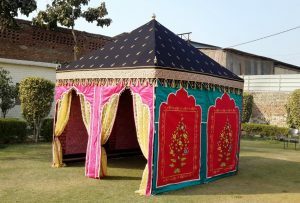 We customize our tents according to the theme and occasion of our client. Our event tents are best suited for Weddings, Birthday party, Milestone celebrations and Events. We also make best quality Sun Shades and Garden Umbrellas for your events and party. 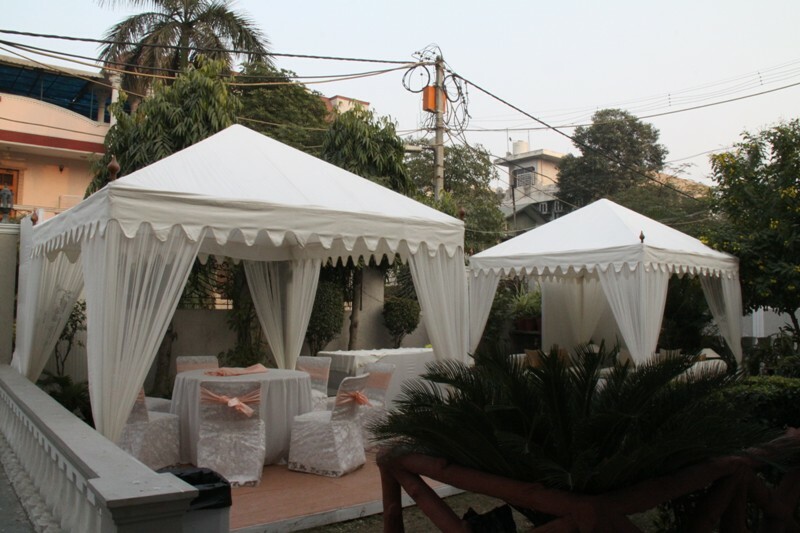 This Beautiful Party Marquee has been designed and developed by our creative team for Select Hotels in New Delhi. 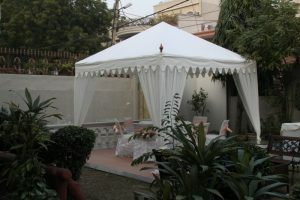 This is a Frame Tent, hence it has been pitched on the terrace for the party. The outer Canvas is rain proof and inner lining is made in golden stars and mirrors. The mirrors reflect the lamp lights at night, giving the beautiful illusion of a Starry sky. 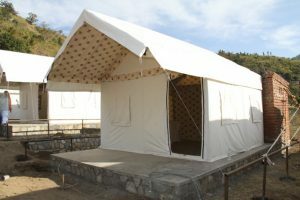 The side walls give privacy to this tent and hence air conditioning can also be used within the tent. You can remove the walls and put up only sheer drapes to let in breeze and light during the day party. 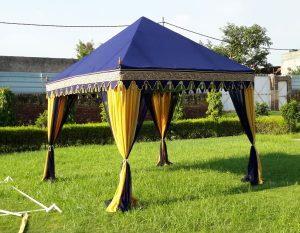 We are the Best Manufacturers and Exporters of Party Tents and Marquees. 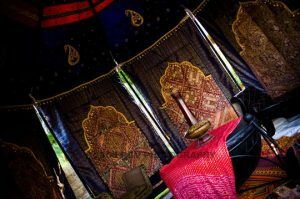 Lets party in an Arabian Tent ! 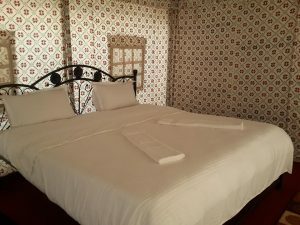 It has the perfect ambiance with Low Floor seating, velvet cushions and bolsters. 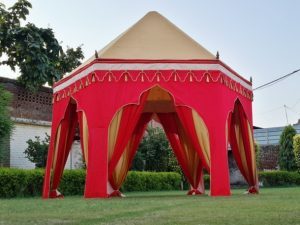 This tent will make you feel like a Maharaja – The King !!! 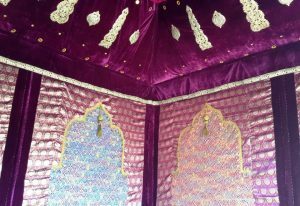 It has a very elaborate and splendid interior with hand embroidery and delicate mirror work on the ceiling and walls. 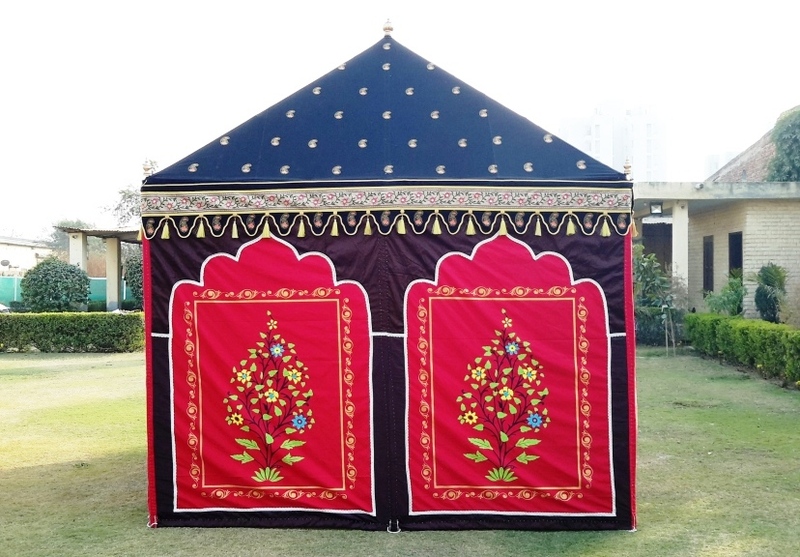 Care is taken to make this tent best rain proof, the Outer is made of heavy duty water repellent canvas with beautiful floral designs and patterns on the walls, to make you fall in love with this tent. 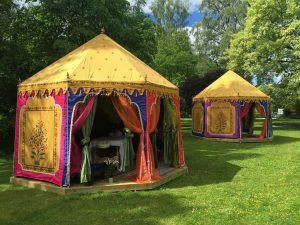 In our Tent Factory, we call it The Royal Khyber ! 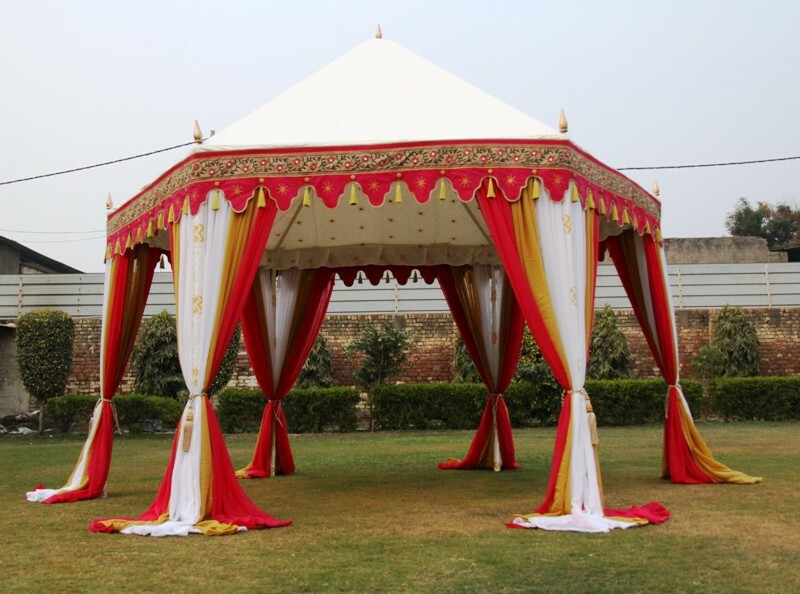 Contact us to buy your Arabian Tent today and select from the available tent models or design your own tent with us. 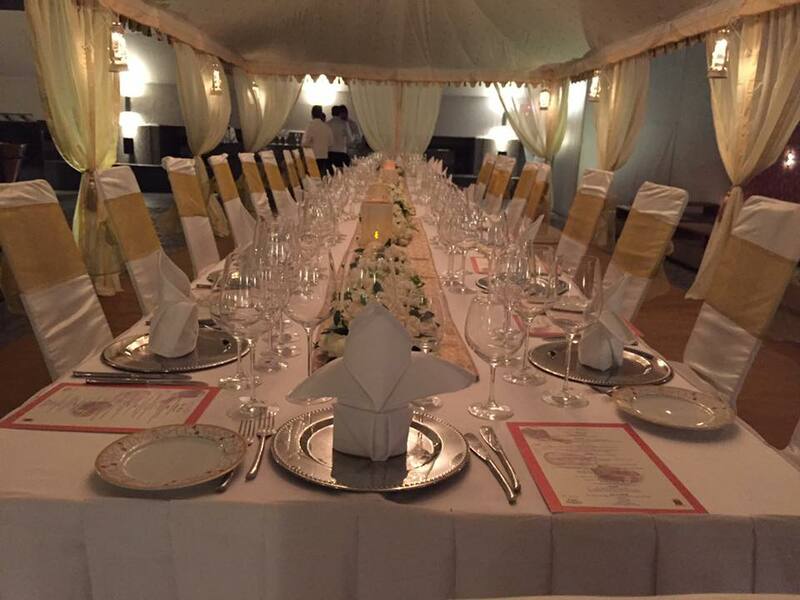 We have an extremely talented creative and design team, so contact us for your Dream Wedding Tent. Do you want your kids to give up video games and play Stations and go play outside ? 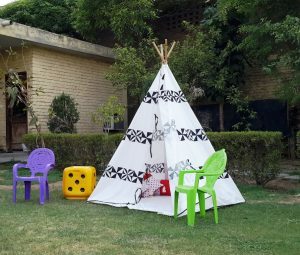 We offer a very beautiful and creative way to get your kids to play outdoors and have fun with their friends. 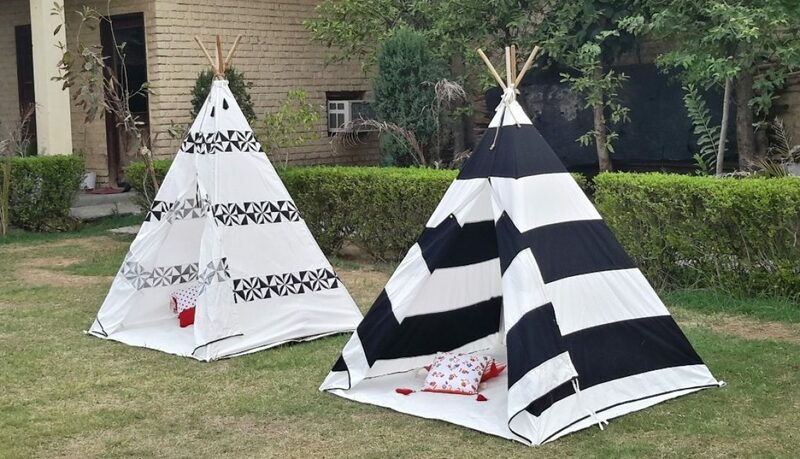 Let your children put all their toys and teddy bears into the Tipi Tent and play whole day, without taxing their eyes on the tech stuff. 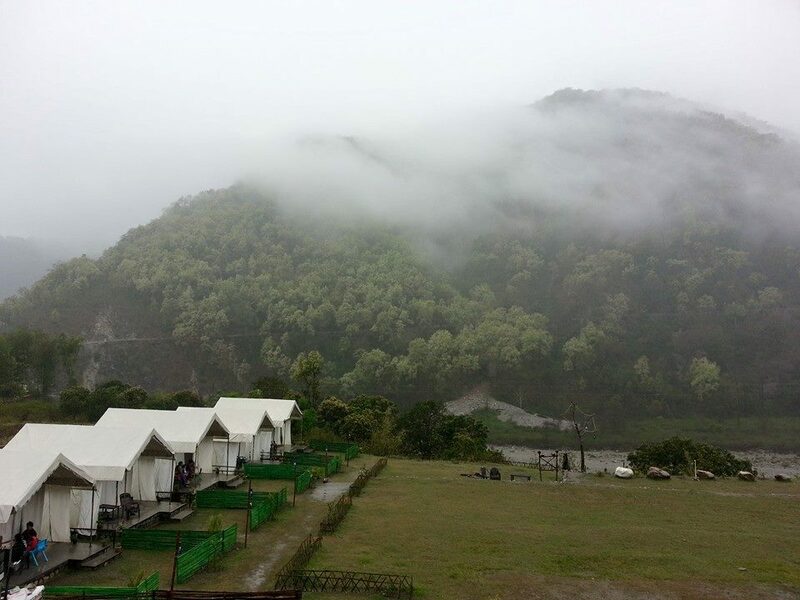 Our Tents are made of breathable organic cotton and have a window for proper ventilation. 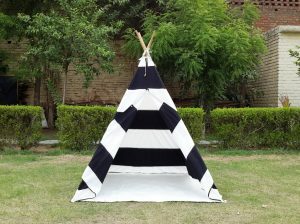 Buy your Kids Teepee Tent today! 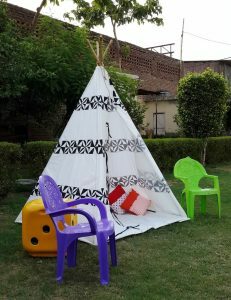 We make the best Kids Tents for our young friends. You can customize the colors according to your Child’s room or your living room and we will make it for your little one. 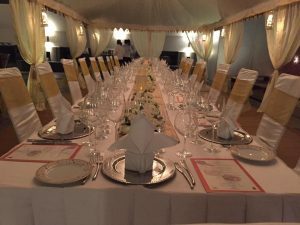 Want to make your wedding a Special event ? 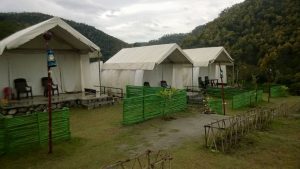 We have the best designer Tents to offer you. 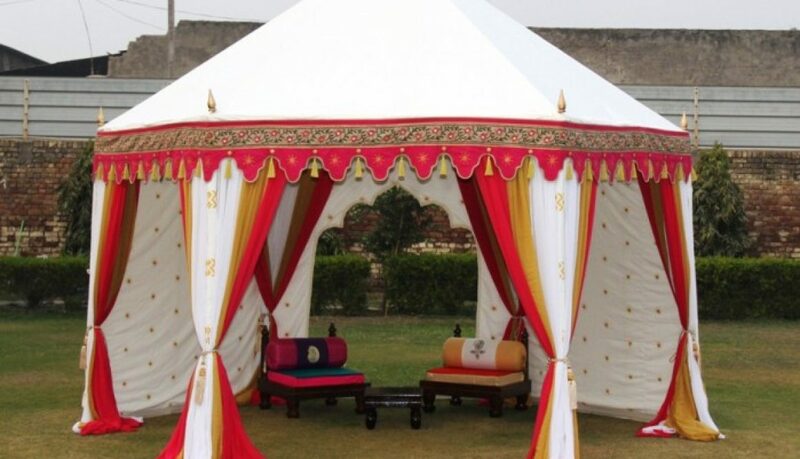 These Raj tents are very beautiful with splendid interiors & elegant set up, whats more ? 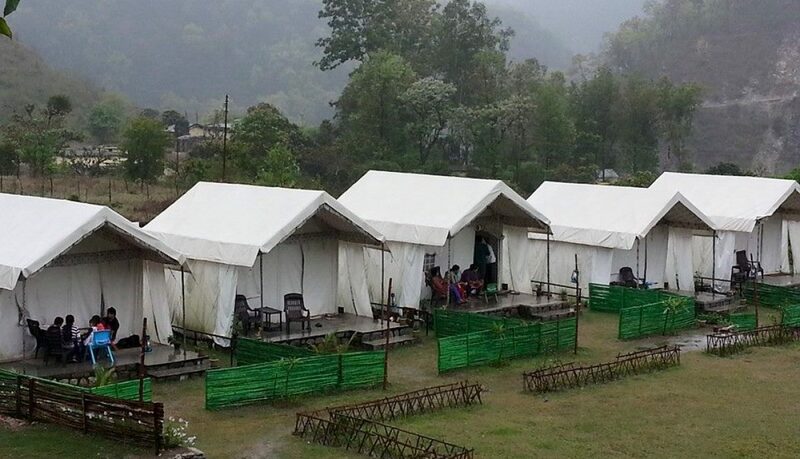 These Indian Tents can also stand in the rain. 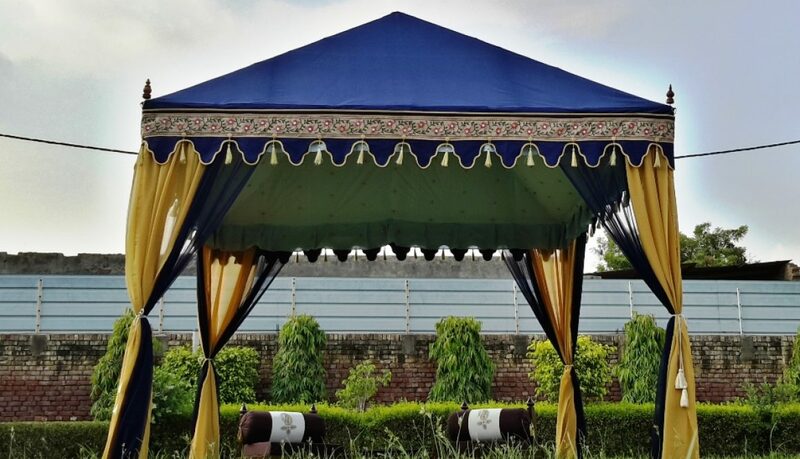 So order your Wedding Tent today and make your wedding the most special event. 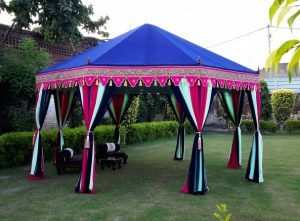 We specialize in Indian Wedding Tents, Wedding Canopy, Garden Gazebos, Marquees for Weddings, Indian Tents, Cupola, Cabanas and Ottoman Tents. 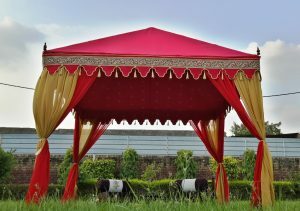 You can have your pick and we will make your Theme Wedding Tent for you. 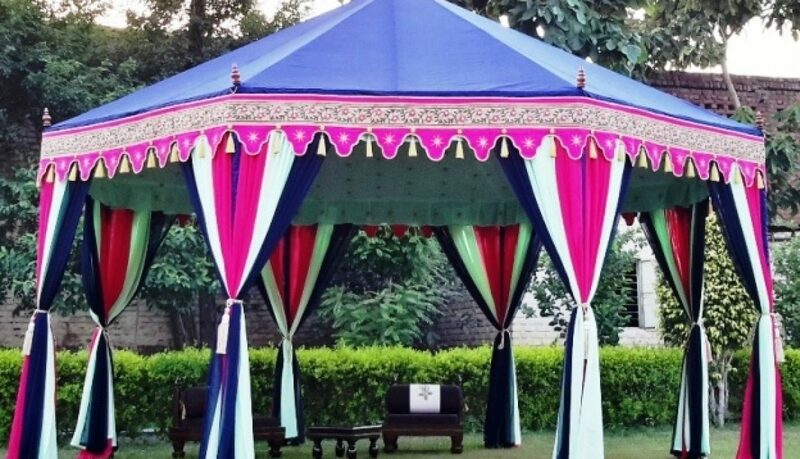 We have very talented designers who give prime importance to detailing in every Wedding tent. 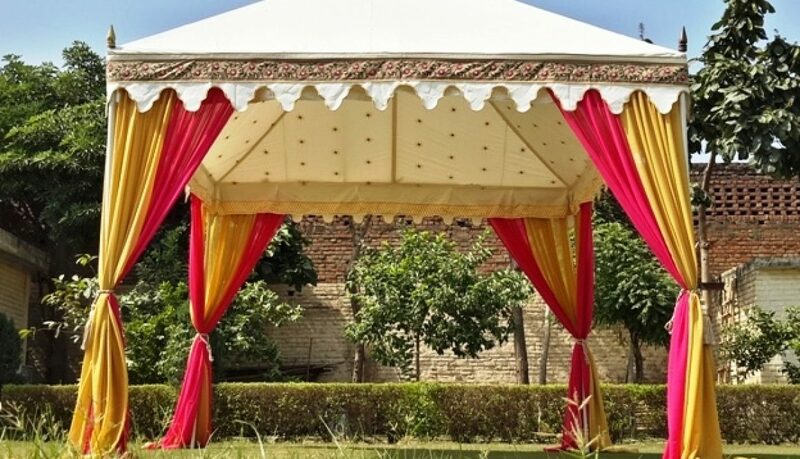 So make your wedding most memorable with our Indian Tents. 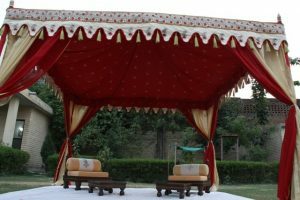 We also make Mandap Stools, Low Wooden seating and Low floor seating with Square cushions & round Bolsters for weddings and events. you can choose from the wide variety of Furniture that we offer. 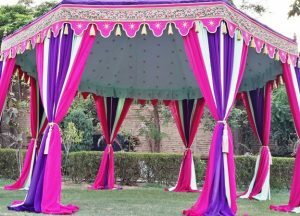 Indian Weddings are full of colors and decorations, We also supply, matkas, Buntings, and Flower Torans for Wedding Mandaps.